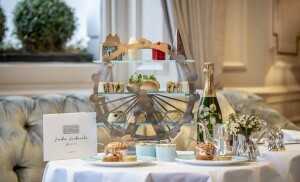 Town House at The Kensington in London just launched a new London Landmarks Afternoon Tea, inspired by London’s most recognizable sights. Presented on a London Eye-styled stand, tea is served alongside a bespoke map of London highlighting Kensington Palace, Covent Garden, and Big Ben. Shou Sugi Ban House, the first wellness retreat of its kind on Long Island, will be opening in Water Mill in spring 2019. The 13-room retreat, set on three acres just next to the Parrish Art Museum, will incorporate many forms of wellness treatments ranging from sound healing to reiki to yoga to hikes on the beach. Each day will begin with a tea ceremony and end with a fire ceremony, punctuated by spa treatments and cooking demonstrations. The Wauwinet, situated on the northeast shores of Nantucket overlooking the Atlantic Ocean, will unveil a multi-million-dollar restoration and renovation of its lobby, library and 32 guestrooms and cottages in April 2019. La Réserve Ramatuelle will reopen in mid-April and will unveil the property’s first beach club on coveted Pampelonne Beach. There will be a beachfront restaurant and lounge chairs and a complimentary shuttle for guests. Alpha Omega Collective is opening in Downtown Napa, across from The Archer Hotel, in late winter/early spring 2019. The tasting room will showcase wines from Alpha Omega, Tolosa, and Perinet wineries by the glass, bottle, or flight. Christian Louboutin has created custom babouche slippers for Royal Mansour, inspired by its ornate design details. The shoes are only available at the hotel’s boutique. PONANT is launching a new seven-night itinerary to “The Essential Azores” departing April 5, 2020. Guests will discover six of the islands including Faial, often called the “blue island” for its myriad hydrangeas and Pico, a UNESCO World Heritage site. Guinot’s new Lift Summum treatment firms and smooths the face, neck, and chest instantly by removing dead cells, redefining the face contour, and restoring radiance. Private workshops and tours at the world’s largest rooftop farm and exclusive access to The Morgan Library and Museum are just two of the themed excursions offered through The Chatwal New York’s new partnership with LOCALIKE. The tour operator created a series of insider experiences for guests staying in one of 14 Chatwal Crown Suites. Guests who book the five-bedroom Fleming Villa at GoldenEye in Jamaica (Ian Fleming’s former home) get a private beach and movie screening room. Suite guests at La Reserve Geneve are offered a personal assistant and exclusive access to reserve a cabana by the outdoor pool with views of Lake Geneva. 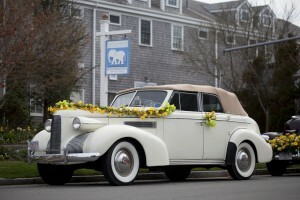 In addition to its gourmet kitchen and prime locale in downtown Nantucket, the historic White Elephant Loft at 32 Main Street offers guests keys to a BMW hybrid-SUV. The crown jewel of Belmond Charleston Place, the Club Level accommodations sit across two floors featuring private elevator access and check-in, and an impressive all-day food and beverage service that includes breakfast, afternoon tea service, evening hors d’oeuvres, and full bar selection. Royal Mansour’s Grand Riad is a palatial hotel-within-a-hotel complete with its own private entrance, cinema, hammam, and swimming pool with a built-in water current. Guests will access to a dedicated staff of butlers, chefs, housekeepers, and watchmen available around the clock. The Nantucket Daffodil Festival Weekend, April 26-28, honors more than three million daffodils that bloom every spring on Nantucket. The Wauwinet will offer a Daffy Tailgate Lunch at TOPPERS; a Daffy Tailgate After Party with live entertainment and shuttle service to/from ‘Sconset; and a two-night accommodation package that includes a picnic for two and special Daffy Weekend hats. Napa Valley’s 8th annual Arts in April celebrates the region’s cultural offerings with more than 50 events taking place at wineries, museums and galleries throughout the month. Guests celebrate Holi, the festival of colors, in India with andBeyond’s A splash of colour in Rajasthan journey on March 20-21 dance to the beat of music and join the massive crowd as they splash each other with colorful powders and emerge coated in a rainbow glow. Cherry BlossomsTravelers to Washington, D.C. can celebrate springtime with the National Cherry Blossom Festival, running from March 20 – April 13. 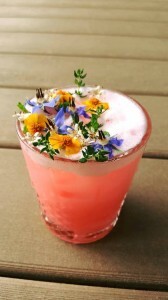 Guests can explore the blooming city from The Dupont Circle and dine under cherry blossom trees in their restaurant, The Pembroke. The Christopher Hotel on the rocky shoreline Pointe Milou offers the best views of the St. Barth Bucket Regatta (March 21-24, 2019). After watching the New York City Easter Parade and Bonnet Festival on Fifth Avenue, onlookers can head over to The Pembroke Room for afternoon tea to dine on petit fours and scones with lemon curd and Devonshire cream. 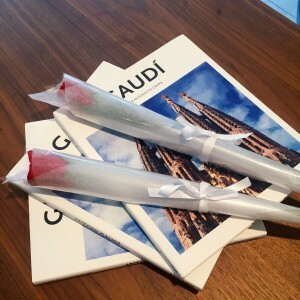 Barcelona’s Saint Jordi festival is held every April 23rd, with men gifting roses to women and women sharing a book with their loved ones in honor of the patron saint of Catalonia. Guests of Almanac Barcelona are just a 10-minute walk from the main action along La Rambla, which transforms into a flower market intermixed with book stalls. Belmond Copacabana Palace will host the famed Carnival Ball on March 2, 2019. Long associated with the glitz and glamour of the Rio Carnival, Belmond pays homage to Italy’s global influence with Dolce Carnevale as its newly renovated Golden Room is transformed into Venice’s St. Mark’s Square for an all-night dance party. For an off-the-grid Carnival experience, travelers can book UXUA Casa Hotel & Spa in the seaside village of Trancoso, Bahia with celebrations centered in the 500-year-old, car-free town square, or Quadrado. Guests can celebrate Cinco de Mayo at Viceroy Riviera Maya with a Mayan Cuisine Class and learn to cook the indigenous fare of the Yucatan Peninsula. Easter at Sugar Beach, A Viceroy Resort in St. Lucia means treasure map egg hunts, chocolate making classes, a Wonderland tea party, and a beach bonfire with s’mores for the littlest of travelers. The rates at Nantucket Island Resorts heat up with the summer sun, travelers who book their stay before peak summer season can enjoy up to 55% off and thinner crowds on the island. After the spring break crowds have dwindled, but the weather still calls for a sunny getaway, Viceroy Riviera Maya is offering a ‘Sun, Sea & Solitude’ deal with accommodations up to 35 percent off, including daily breakfast and $100 resort credit. For those looking for a South of France holiday, there’s no better place to experience la belle vie than La Réserve Ramatuelle overlooking the Mediterranean Sea. Go in June before the prices climb in July and August (as do the crowds). Classic tents at Kenya’s andBeyond Kichwa Tembo Tented Camp on the Masai Mara jump from $330 per person per night in June to $450 for the rest of summer. Spring 2019: Shou Sugi Ban House opens in The Hamptons offering multi-day wellness retreats. Shopping and basic research in the pre-internet days often involved looking up shops, restaurants and services in the Yellow Pages, a book of ads, addresses and telephone numbers that was so thick it also worked well as a booster seat at the dinner table. Now we just whip out our phones and ask Siri or Google to pull up whatever we need. Or we go to a website that gathers the information for us. The age of comparison websites has arrived in full force. When shopping and researching, we want to see all our options in one place instead of going from website to website. So, when traveling, we research hotels at TripAdvisor. When buying a home, we go to Zillow. For airline tickets, we go to Expedia and many other online sources. For restaurants, we go to Yelp.com. We can go to Match.com to find a date. And when planning a funeral, we can even go to Funeralocity. Brands need to articulate their value propositions in short profiles to succeed in the competitive frame of comparison shopping sites. They must clearly demonstrate points of differentiation as well as show high resolution photos, videos, and positive reviews. A brand’s online profile is more than just its website. 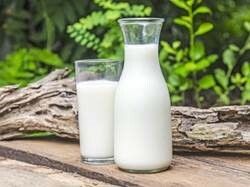 It is multifaceted and needs to stand out in the eyes of consumers as they view their alternatives. 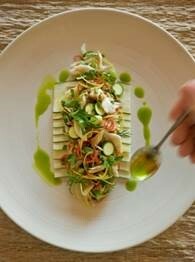 Following a top-to-bottom refurbishment, The Christoper’s Christo restaurant reopens November 1, 2018 with a new concept focusing on organic meats and vegetables. Timed with the Saint Barth Gourmet Food Festival, Christo’s chef Nicolas Tissier is partnering with Michelin-starred chef Virginie Basselot to create a limited-edition menu. In South Africa’s Sabi Sand Game Reserve, the completely new andBeyond Tengile River Lodge will open on December 1, 2018 and will share unfenced borders with the Kruger National Park. Raised above ground level, the spacious suites will offer sunken lounges, elegant bedrooms and bathrooms that open out onto the forest, creating private spaces in the open air. Guinot’s new Anti-Dark Spot Serum, launching in January 2019, brightens dark spots caused by sun exposure and aging with a two-week regimen featuring pure vitamin C.
Holiday season in New York City kicks off with the Park Avenue Christmas Tree Lighting on December 2nd. After the lights go on, carolers can pop into Jaques of The Lowell for a warming cocktail. 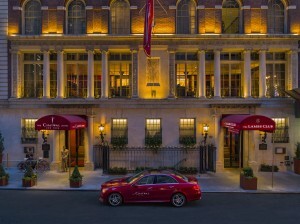 The Chatwal, New York has launched an exclusive holiday offering for its guests with Bloomingdale’s, including a personal shopping consultation at Bloomingdale’s At Your Service, complimentary chauffer service in the Mercedes-Benz house car, a complimentary ‘Luxury Blow Dry’ courtesy of Fernando Valencia, and a surprise holiday gift. PONANT will launch a brand new 11-day/10-night itinerary crossing four of the five Great Lakes of North Americas, departing September 12, 2019 from Quebec. With stops in cosmopolitan Toronto, Niagara Falls, and Flowerpot island, famous for its beachfront “flowerpot” stone pillars. The Villa at Hotel Villagio at The Estate in Napa Valley is in its final stages of renovation. The five-bedroom villa, furnished with Hastens beds, has 20-foot ceilings with expansive walls of windows overlooking the pool, hot tub, and outdoor lounge space. Guests who book the Garden Suite at The Chatwal reserve exclusive access to a Flowelier: a specialized butler who teaches the suite residents how to make the most gorgeous flower arrangements. 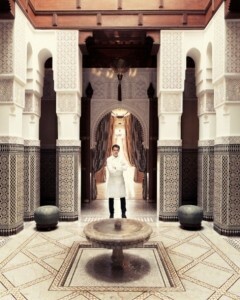 The Bath Butler Royal Mansour’s Grand Riad helps guests relax after a day out in the souks. 33 of The Lowell’s 74 rooms have wood-burning fireplaces. The dedicated Fireplace Butler can prep the fire so guests return to a toasty room with a crackling fire and a selection of charcuterie and cheese or marshmallows and s’mores supplies. Upon arrival, guests can expect a visit from the Soap Concierge at Viceroy Riviera Maya to present a selection of hand-made soaps, crafted with seasonal ingredients. Once guests have made their selection, the Concierge will slice personalized bars for travelers to use during their stay. Christmas Eve dinner in Provence is not complete without 13 desserts. The tradition is a reference to Christ and his twelve apostles at the Last Supper. Custom dictates that each guest must have at least a small bite of each of the 13 sweets. The components vary by region but always include pompe à l’huile (olive oil and citrus-infused bread), fruit, and black and white nougat. Domaine de Manville guests can expect carriage rides and holiday movies in the private screening room in addition to the sweet treats. Ring in the New Year the traditional Japanese way at Park Hyatt Tokyo with a customary bowl of Toshikoshi Soba on New Year’s Eve, symbolizing good luck for the year ahead. Guests can join the staff and slurp down a bowl of these auspicious noodles just before midnight. 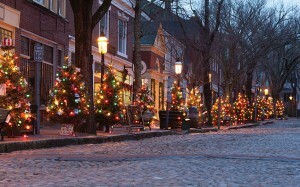 Nantucket celebrates the holidays with its annual ‘Christmas Stroll.’ Now in its 45th year, hundreds of Christmas trees line the streets for the three days of merriment with carolers, festive treats, and a visit from Santa. Calistoga’s 23rd annual Lighted Tractor Parade on December 1 is the ultimate small-town holiday event in celebration of the region’s agricultural heritage. Vintage and modern tractors and antique trucks decked out with dazzling lights and holiday décor will parade down Calistoga’s charming Main Street. In the English countryside, Belmond Le Manoir aux Quat’Saisons’ guests can join the on-property cookery school created by Michelin-starred chef Raymond Blanc OBE for a half-day lesson on crafting the traditional Christmas lunch. 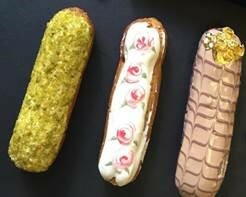 Some highlights from previous years’ classes include salmon in champagne cream sauce, duck breast, and chocolate fondants. Keeping with French traditions, La Reserve Paris’ two Michelin-starred Executive Chef Jérôme Banctel and Head Pastry Chef Adrien Salavert have crafted a limited edition buche de noel for this festive season. With a gold-accented outer layer surrounding a filling of Michel Reybier champagne and fruits including mango, passion fruit, pineapple, and coconut. Theater-lovers who opt to sojourn at The Chatwal, New York will enjoy two premium tickets to Harvey Fierstein’s Torch Song as it makes its Broadway debut. The two-night minimum stay package will also enjoy a pre-theater dinner at the Lambs Club and a Harvey Fierstein-signed playbill. Travelers can take advantage of this package through February 2019. In The Holy City, Belmond Charleston Place’s Third Night’s a Charm deal offers a 25% savings on a three-night stay. While the offer is valid for all travel from November 11 through the New Year, the hotel delights during the holiday season with a fully-operational train display – a replica of the Venice Simplon-Orient-Express – under the hotel’s Georgian open-arm staircase. Whether it be Marylebone, Kensington, or the up-and-coming Bloomsbury, travelers can live like locals for a quick long weekend with a curated itinerary of insider experiences with The Doyle Collections ‘Slice of the City’ itineraries. Travel to Napa Valley on easy, direct, domestic flights to experience Cabernet Season starting in November. 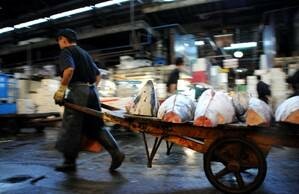 During this season, the crowds have dwindled, the prices are lowered, and the pace slows down. As its moniker suggests, the region’s famed Cabernet Sauvignons are released during this period for travelers to get first access to the season’s selection. New Yorkers don’t always have time to plan a big trip – but still need that escape from reality. With a staycation at The Lowell just off Madison Avenue, guests can cozy up next to their own wood-burning fireplace under an alpaca throw with a glass of vino, while their fireplace butler creates a homey atmosphere with fresh logs and aromatic scents. With direct flights from six major US cities to St. Lucia, Sugar Beach, A Viceroy Resort is a quick and easy destination for a long weekend. Far enough South to be out of the main hurricane belt, St. Lucia has beautiful weather year-round – offering a sunny escape from reality. Especially tempting in November and early December before prices go up around the holidays. With Delta’s new daily nonstop flight from New York to Kingston launching this December, travelers can escape to Strawberry Hill in the blue mountains to experience an unexpected side to the Caribbean island with lush greenery replacing sandy beaches and cool, misty air replacing the heat of the blazing sun. February 1, 2019: Take part in a full-day course at Belmond Le Manoir aux Quat’Saisons’ cookery school to learn Raymond Blanc OBE’s mother’s favorite recipes. On October 24, La Maison du Chocolat will launch a hot cocoa cart in partnership with The Surrey hotel. Set in front of the La Maison du Chocolat’s Madison Avenue boutique, the cart will serve the signature hot chocolate by the famed Parisian chocolatier. The Taproom will return to Nantucket’s Jared Coffin House for the 2019 season. Along with the return of the pub-style restaurant, the historic property will add three one-bedroom suites and two additional guestrooms to the inventory. The Dupont Circle in Washington, DC will relaunch in January following a complete redesign of the restaurant, bar, lobby, and Dupont Suite in collaboration with Martin Brudnizki Design Studio and Clodagh Design. andBeyond’s new Phinda Impact Small Group Journey kicks off on its inaugural departure next month. This 7-day journey combines wildlife conservation (with an experience like rhino notching or elephant collaring), interaction with the local community, and a day-in-the-life of an andBeyond ranger – from learning tracking to rifle training to sleeping out beneath the stars. Nayara Springs is launching Wellness Experience Packages inviting travelers to disconnect from reality in the rainforest of Costa Rica – days are filled with yoga and meditation, daily spa treatments, healthy mixology classes, and walks through the on-site sloth sanctuary. The Lowell’s classic tea room, the Pembroke Room, is relaunching with a new outdoor space this fall after a refresh and redesign. PONANT’s new EXPLORER ship, Le Champlain will launch on October 25. Emmanuel Sauvée, CEO and Founder of PONANT will join the inaugural sailing, which will travel from Honfleur, France to Lisbon, Portugal. The Westbury has just launched an Art Trail around Dublin showing art-lovers the best of Irish public art and sculptures around town – including The Westbury Art Collection, where the work of masters such as John Lavery, Norah McGuiness, and Louis le Brocquy are displayed in The Gallery. Passengers aboard the new EXPLORER ship Le Dumont D’urville’s History, Art & Architecture along the North Sea sailing enjoy an art-focused itinerary, including an after-hours tour of the modern and contemporary art Stedelijk Museum in Amsterdam. On andBeyond’s Sensory City Excursion of Santiago, art-lovers can explore sites including the Chilean National Museum of Fine Arts, home to the works from celebrated Chilean artists like Roberto Matta and Luis Vargas Rosas. Andy Beckstoffer, a renowned vintner and developer of the Napa Valley region, has commissioned a 11 by 70 foot mural of Beckstoffer Farms during fall for First Street Napa, painted by the Bay-Area artiest Morgan Bricca. Strawberry Hill in Jamaica offers a tour that brings guests through the graffiti-plastered Fleet Street in Kingston. On Nantucket…Celebrate Christmas Stroll December 1-3, 2018. Carolers wander through the cobblestone streets singing holiday tunes and The Whaling Museum hosts the annual Festival of Trees, which features 80 brilliantly decorated trees designed by local artists. The historic Jared Coffin House is located in the heart of the event. In New York… While strolling through the Upper East Side on this year’s Winter Solstice (December 21), passersby can stop for some homemade hot cocoa at The Lowell’s outdoor treat cart. In London… At The Kensington, a ‘Festive Tale as Old as Time Afternoon Tea’ menu will be available from December 1-31, 2018. The sweets and savouries featured in this afternoon tea are inspired by the characters and scenes of the classic film, Beauty and the Beast – with a holiday twist. In Geneva…Come the holidays, La Réserve Geneva welcomes its onsite ice-skating rink. Children can borrow skates on a complimentary basis and after they’ve tired themselves out on the ice, they can head to the cozy tent next door for crepes and hot chocolate. In Napa Valley…The Winter in the Wineries Passport offers a onetime fee for a ‘passport’ that gives guests access to complimentary wine tastings at seventeen Calistoga wineries during Napa Valley’s Cabernet Season. Charles Masson, restaurateur of Majorelle at The Lowell, offers his own take on the classic French dessert, Oeufs à la Neige – whisked egg white coated in vanilla crème anglaise. Thomas Keller’s Bouchon Bakery in Yountville is known for its eponymous dessert Bouchons au Chocolate, small chocolate cakes baked with chocolate chips and dusted with confectioners’ sugar, that resemble corks (bouchons in French). La Maison du Chocolat’s new Halloween Pumpkin Bouchée is a dark squash praline bouchée covered with a dark chocolate pumpkin-shaped plaque décor. Chocolate-lovers at Sugar Beach, A Viceroy Resort can learn how to make their own dark chocolate truffles and traditional St. Lucian Cocoa Tea from the resident pastry chef. Island Outpost’s GoldenEye offers homemade ice cream with ingredients from owner Chris Blackwell’s 800-acre Pantrepant farm with tropical flavors like spicy scotch bonnet pepper or sweet mango. Each flavor at UXUA Casa Hotel & Spa’s ice cream parlor is made in micro-batches, completely dependent on fresh ingredients picked daily from the property’s gardens, such as chocolate and Bahian pepper or guava and jambo, and guests can create and name their own flavor. Guests at andBeyond Ngala Safari Lodge can indulge post-safari with the lodge’s custom rocky road nougats and crunchies – sweet treats that combine ingredients like marshmallows, coconut, white chocolate, and dried cranberries. PONANT partners with Ladurée to offer guests complimentary macaroons onboard. November 22, 2018: Majorelle at The Lowell will have Thanksgiving baskets to bring home on offer. November 29, 2018 – December 11, 2018: PONANT’s new, Treasures of Seychelles itinerary will visit islands throughout the Indian Ocean. January 2018: The River Lee in Cork, Ireland, will emerge from a renovation including an updated bar, restaurant, and suites. 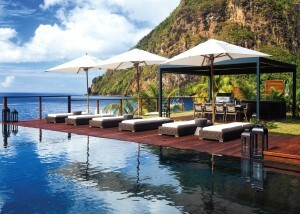 Sugar Beach, A Viceroy Resort is building a new collection of island homes, the Piton Residences. These St. Lucian retreats will have four or five bedrooms and will be perched between the UNESCO World Heritage-listed Pitons above the Caribbean Sea with unbeatable sunset views. andBeyond’s new 11-day India Mobile Camping Small Group Journey weaves travelers through Delhi, Kalinjar, Panna National Park, Orccha, and Kuno on a glamping adventure to explore India’s history and wildlife. 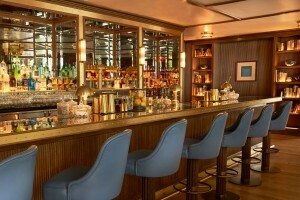 Rosé Thursdays is launching on May 3 at Jacques, the new bar at The Lowell in New York. PONANT announced the launch of two additional ice-class vessels, Le Bellot and Le Surville, which will expand its fleet to 12 ships with 460 departures by 2021. 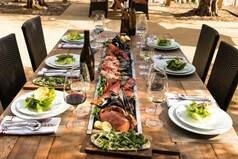 Napa Valley’s Jamieson Ranch Vineyards’ Mini-Moments is a new family-friendly experience offering guests the opportunity to enjoy a tasting of five wines whileinteracting with miniature horses – Whinnie the Pooh, Sweet Jane, and Molly. Measuring just 38 inches in height, the “minis” are trained as therapy animals. The Culinary Institute of America at Copia in Napa Valley now offers hands-on cooking experiences in its new 9,000 square-foot state-of-the-art kitchen. Themes include A Beginner’s Guide to Sushi Rolls, Healthy Cooking, Exploring Brazilian Cuisine, and Grilling Like a Pro. 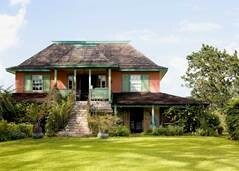 In celebration of Ian Fleming’s 110th birthday, Island Outpost is offering a new four-night package at GoldenEye and Strawberry Hill with champagne, bird watching, and a picnic at Noel Coward’s Firefly. Rates start at $2,435 for two guests. This summer, Royal Mansour is offering a new Prestige Riad package perfect for families or large groups. Guests will enjoy complimentary non-alcoholic drinks from the mini-bar and one pool pavilion per stay with a main sitting room, terrace, and private bathroom when booking any three-bedroom riad. 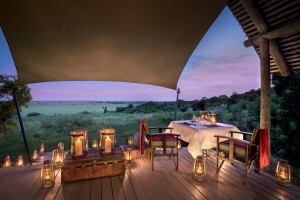 At the end of an afternoon game drive, guests at the newly-refurbished andBeyond Bateleur Camp are driven to an escarpment overlooking the Masai Mara to discover the dream sundowner setting: a full bar set up fireside with andBeyond staffers on-hand to whip up cocktails and pass hors d’oeuvres. The experience is topped off with a surprise performance by a group of Maasai warriors. 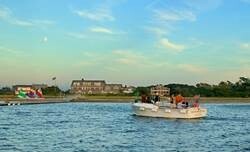 Nantucket Island Resorts partners with members-only Barton & Gray Mariners Club to offer guests access to their fleet of Hinckley yachts for full- or half-day experiences. Located on the shores of Lac Léman, La Réserve Geneva can arrange for guests to have a private helicopter ride over nearby Mont Blanc. Belmond has partnered with British equestrian polo player and international model Jodie Kidd to host an exclusive six-night Horseback Safari departing September 25, 2018. 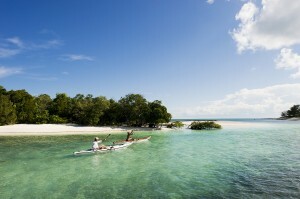 Guests will split their time between Belmond Eagle Island Lodge and the newly redesigned Belmond Savute Elephant Lodge. Highlights include daily safaris with Jodie through the Okavango Delta, evening sunset cruises, and a traditional Botswanan Boma dinner. In partnership with famed French perfumer Serge Lutens, Royal Mansour provides exclusive access into his private Moroccan home. Guests will travel by motorcycle sidecar to the estate, which is otherwise closed to the public, where they will enjoy a private tour through the laboratory where Lutens has created over 70 signature fragrances and his eponymous cosmetic line. During the summer months, JetBlue operates direct flights to Nantucket from Boston, New York, Washington D.C. and now Charlotte. Stay at the White Elephant Village, one of the few in-town hotels with a swimming pool and ice cream cart with complimentary sweet treats. With direct flights from New York (and other major cities) arriving in St. Lucia in time for lunch, weekend warriors can get a quick slice of paradise at Sugar Beach, A Viceroy Resort and be back for work on Monday. Groups and families can stay in one of the new ultra-luxe Beachfront Collection Residences complete with private beach access, an infinity pool, and postcard views of the Pitons for a suped up summer rental. Couples looking for a quick urban getaway can zip over to Washington, DC for a little sight-seeing, art, history, and even some romance. 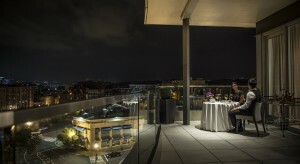 The Dupont Circle offers a Private Chef Experience on the suite’s outdoor terraces overlooking the city lights – complete with a personalized menu, some bubbly, and a VIP turndown service. Only a two-hour flight from New York, travelers can make the most of their weekend getaway to the Holy City. Belmond Charleston Place offers bespoke architecture tours through the city, a horizon-pool situated under a retractable glass roof, and innovative southern cuisine at the infamous Charleston Grill. Located in the Grade II-listed building designed by Sir Edwin Lutyens, The Bloomsbury recently emerged from a renovation spearheaded by design darling Martin Brudnizki. Special attention was paid when restoring the hotel’s historic elements, including the original entrance, the fireplace in the new Sitting Room, and the double height ceilings in the space that is now home to the buzzy Coral Room bar. Built as a luxury apartment house in the 1920s and a go-to for the likes of F. Scott and Zelda Fitzgerald, Madonna, and Bruce Springsteen, this Manhattan mainstay has retained its timelessness through its recent $25 million renovation. The Lowell’s classic tea room, the Pembroke Room, will reopen this spring with a new outdoor space as the finishing touch. The three-story Jared Coffin House, built by and named for one of Nantucket’s original prominent whaling merchants, was one of the few buildings to survive the great fire of 1846. Today, the landmark Inn is set on a prime corner of the cobblestoned downtown, surrounded by the top restaurants and boutiques. Belmond Mount Nelson Hotel opened in 1889 as the first luxury hotel in Cape Town – and the first to offer both hot and cold water. Originally adopting its pink exterior to celebrate the end of World War I, the hotel celebrates its 100th year in the cheery hue with themed cocktails, spa treatments, and new experiences. Celebrating its centennial anniversary in 2018, Majestic Hotel & Spa Barcelona was the city’s first luxury hotel – first opening its doors on Paseo de Gracia for just 10 cents per night. The neo-classical building has been family-owned since the beginning, with the Soldevila-Casals family taking over in 1963. 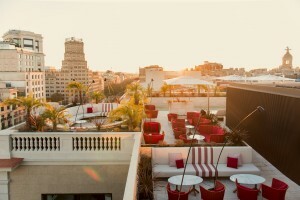 The hotel now features 303 rooms, a rooftop bar and swimming pool, and the largest suite in Barcelona, the Royal Penthouse Suite. Built in 1905, The Chatwal is one of the last remaining buildings designed by famed architect Stanford White and was originally home to America’s first professional theater club. 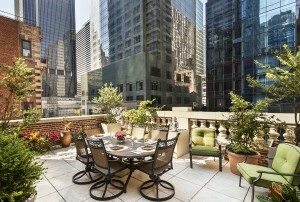 Following a redesign by Thierry Despont in 2010, The Chatwal now features 76 keys with 14 spacious terraces – the highest concentration of terraces for any hotel of its size in Manhattan. La Réserve Paris was built in 1854 and owned by the family of the Duc of Morny (step-brother of Emperor Napoleon III) until 1888. The Haussmann-style mansion in the city’s eighth arrondissement was transformed into a hotel in 2015, while retaining the feeling of 19th century private apartments. Original elements include five marble fireplaces and the embossed Cordoba leather walls in Le Gabriel, the hotel’s two Michelin-starred restaurant. Belmond launches new activities, partnerships, and itineraries across its collection as winter makes way for the new beginnings of spring. Offering a tailored journey for every kind of traveler, families can plan holiday break, couples can enjoy a romantic escape to Italy, and adventurers can book a truly over-the-top experience. Ahead are the brand’s newsiest bytes for spring. 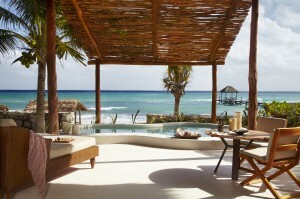 Should any of the below pique your interest, please reach out to belmond@alicemarshall.com for more details. PAMPERED TOTS: Families can enjoy a relaxing afternoon in Belmond Reid’s Palace’s Wellness Centre complete with the kid-friendly Angelsense therapy, a soothing massage designed to improve quality of sleep and strength immune systems. For added incentive, Belmond Reid’s Palace recently launched the Family Package, including 50% off a second room with a five-night stay, daily breakfast, and three dinners with complimentary dining for children under 12 years old. 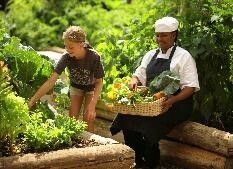 JUNIOR CHEFS: Belmond Le Manoir aux Quat’Saisons encourages budding culinary enthusiasts to join Michelin-star chef Raymond Blanc’s Cookery School for half- or full-day ‘Adult and Children’ cooking courses. The junior master chefs can also race through the gardens on a treasure hunt, design their own vegetable patch, and become pen pals with Bear Blanc, the hotel’s teddy bear chef. 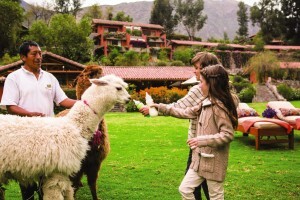 NATURE EXPLORERS: Nestled along the Sacred Valley’s Urubamba River, Belmond Hotel Rio Sagrado invites its tiny explorers to embrace the outdoors with alfresco art classes using local materials, the chance to hand feed the hotel’s baby alpacas, and outdoor movie nights underneath the stars, complete with a popcorn waiter service and dessert bar. VENICE: In honor of its 60th anniversary, the iconic Belmond Hotel Cipriani will host cooking classes highlighting historical recipes, new insider tours throughout Venice, and a scenic boat tour aboard the meticulously restored, 16-meter motor sailing yacht, Edipo Re. 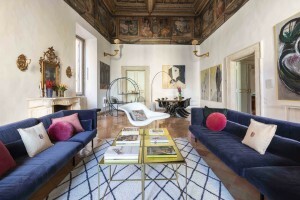 FLORENCE: Art-lovers and wine-connoisseurs will unite with two new tours from Belmond Villa San Michele. Available together as an immersive full-day journey or separately as half-day excursions, the first of the experiences is a visit to Chianti Sculpture Park, the one-kilometer sculpture trail embracing a variety of materials from traditional marble to modern neon-light and glass. The second, titled Art of the Treasure Hunt, brings guests through a collection of contemporary installations hidden among historic Tuscan wineries. Belmond Villa San Michele will reopen on March 29. RAVELLO: Through Belmond’s new partnership with Leica Sport Optics, guests of Belmond Hotel Caruso can enjoy a series of early morning experiences aptly titled, “First Light.” Outfitted with a complimentary lightweight Trinovid 8x42HD Leica binoculars and a curated map, guests can watch the wildlife up close as day breaks over the Amalfi Coast. On the nearby island of Mallorca, Belmond La Residencia will also offer the “First Light” experiences through the UNESCO World Heritage site. Belmond La Residencia is open now, while Belmond Hotel Caruso will reopen on March 30. PORTOFINO: In a secluded bay near Belmond Hotel Splendido, the Abbey of San Fruttuoso is host to an after-hours private concert. After arriving by private boat, guests can explore the abbey’s cloisters and vaults and learn about the monks’ daily lives before reconvening in the courtyard for cocktails and a concert featuring music of the guests’ choosing. Belmond Hotel Splendido will reopen on March 30. SICILY: Guests of Belmond Villa Sant’Andrea can explore the remote island of Filicudi with an insider tour hosted by three resident islanders. Guests will enjoy breakfast with a former antiques dealer who relocated to the island 30 years ago with his partner, meet with an artist who made her home in a local cave, and sit down with a couple in their family-built villa to dine on a late lunch featuring fresh catch and local produce. Belmond Villa Sant’Andrea will reopen on April 12. MUSIC AFICIONADOS: Belmond has launched a new partnership with the London Philharmonic Orchestra that includes exclusive performances in Machu Picchu, Peru; Iguassu Falls, Brazil; and the Okavango Delta, Botswana. These intimate concerts will be held throughout 2018 and 2019, and guests staying on property will enjoy additional perks such as reduced ticket prices or a pre-concert dinner. GOLF BUFFS: Ryder Cup champion Sam Torrance returns to host the four-night ‘Scottish Golf Tour’ aboard Belmond Royal Scotsman departing June 25, 2018. 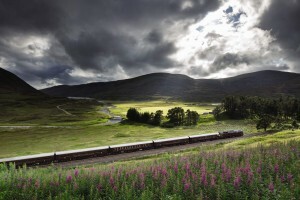 Guests will play three rounds of golf at Scotland’s top courses, including one with Sam at Royal Durnoch Golf Links, before spending the evening in the train’s Observation Car, where Sam will share tips and stories from his competition days. 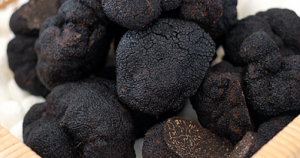 WINE CONNOISSEURS: What many wine lovers attempt in a lifetime, Belmond Amaryllis accomplishes in a week with the Grand Cru itinerary through Burgundy, where guests will have the opportunity to taste all 33 Grands Crus. Highlights include exclusive access to the vineyards at Puligny Montrachet and a private dinner in the cellars of Domaine Droughin-Laroze hosted by the owners themselves, Olivier Leflaive and Christine Droughin. November – Belmond Mount Nelson Hotel celebrates 100 years in its rosy-pink hue. Are you feeling the love this weekend? April 23rd happens to be Barcelona’s most romantic day of the year, giving Cupid quite a run for his money. Known as Sant Jordi Day, the Catalan tradition dictates that gents give ladies a single rose while women give a book in return. Throughout the city, you’ll see plenty of makeshift book and rose stalls lining the streets, encouraging love birds to celebrate. Joining in on the festivities, Majestic Hotel and Spa in Barcelona sets up a rose stand offering ‘pay what you can’ roses. All proceeds will go to the Fundacio IRES, helping children at risk of social exclusion. Celebrating a loved one and giving back? A win win in our book. Even if you can’t make it to Barcelona this weekend, grab your sweetheart and celebrate on Saturday. All of us at AMPR plan on enjoying the holiday with a little Gaudi reading material, some roses, and of course….a glass or two of rosé. August 2nd is perhaps the sweetest day of the year. We’ve got the scoop on where you should be celebrating Ice Cream Sandwich Day (pun intended). Here are our picks for the best childhood favorite revamps. Skip happy hour and satisfy your sweet tooth. As if Shmackary’s cookies weren’t tasty enough on their own, you can amplify your dessert by adding vanilla bean gelato. Choose any two cookies (they have over 65 different flavors) to create the ultimate frozen treat. 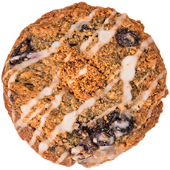 We suggest one Classic Chocolate Chip and one of their seasonal Blueberry Cobbler cookies- you won’t be disappointed. No one feels bikini-ready after a sugar binge. Here’s a way to celebrate and lessen the guilt that your two-piece brings. 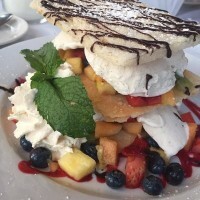 The Fresh Fruit Ice Cream Sandwich at Harvest on Fort Pond is served with vanilla gelato, hot fudge and raspberry coulis- so not entirely guilt free, but fruit is healthy right? 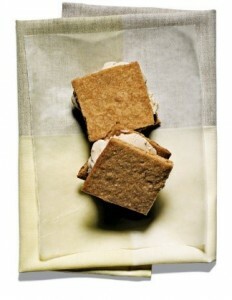 Photo Courtesy of Yelp(er) Jay G.
Now this one is definitely not your traditional childhood treat- Cognac-Ice-Cream sandwiches. Inspired by a bakery in San Francisco that refused to separate booze from dessert, this recipe is sure to impress any of your “adult” guests. 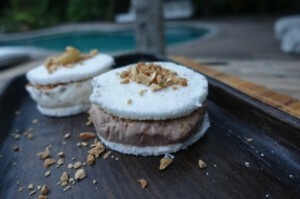 Made from cashew nuts of local farms and cacao beans from the garden, UXUA’s homemade ice cream is the center of this savory sweet. When dessert meets innovation, only good things can happen!